President Of Irish Sailing Jack Roy speaking at the announcement. 2into3 would like to express its delight with Irish Sailing’s announcement for a new Performance Headquarters, funded entirely by the Irish Sailing Foundation and located on the grounds of the Commissioners of Irish Lights, Dun Laoghaire. 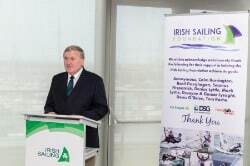 The aim of the Irish Sailing Performance HQ is to house the senior Irish sailing teams and improve both training and educational opportunities for them, thereby creating systematic medal potential. The Performance HQ will be entirely mobile and will consist of three converted shipping containers which have space for briefings and athlete education, a gym, gear storage and a boat maintenance area. The athlete briefing room can then be shipped directly to international competitions such as the Olympics in Tokyo 2020 and provide a base for our athletes overseas. Outside there will be a boat park and a pontoon for launching the boats. The new facility will provide our senior sailing athletes with an improved, multi-dimensional performance environment. Regular events such as the Youth Nationals will continue to be hosted by clubs. Subject to planning requirements, it is hoped that work will be completed by end of summer 2018. 2into3 has worked closely with Irish Sailing to achieve this milestone through our consulting and recruitment services since 2016. To learn more about how 2into3 builds capacity of sports organisations please contact 2into3’s Director Dennis O’Connor at Dennis@2into3.com or call 01 234 3184.